Reindeer herding in the Arctic has important social, economic, and cultural functions in indigenous Sami society, but it is threatened by the impacts of anthropogenic climate change. Seasonal herding and migratory patterns of the reindeer depend upon the availability of low-productive forage and therefore require large grazing areas. Increased temperatures and precipitation as a result of climate change will affect grazing capabilities, and will consequently require greater pastureland area and flexibility in migratory patterns. As a result of the development of infrastructure and legal gray areas over Sami self-determination and traditional land ownership, the migratory flexibility needed in the event of significant environmental stresses may not be feasible. Despite numerous laws enacted in the Nordic countries guaranteeing the rights of the Sami to self-determination in multiple facets of their communities, land and resource access remain complicated issues and no definitive resolution on the rights of the Sami to their traditional lands has been enacted. Thus, tensions over land use and ownership are likely to escalate as land becomes scarcer, and isolated incidences of conflict in the Sami region may arise. The Sami, or Saami, are the indigenous people of the Arctic regions of Norway (population 60,000), Sweden (14,600), Finland (9,350), and Russia’s Kola Peninsula (2,000) (CIA, 2011), but often reside for part of the year across national borders. The Sami are best known as reindeer herders but they also make their livelihoods in fishing, hunting, farming, and traditional handicrafts, and therefore have a strong and vital connection with the natural environment. In the Nordic countries, only individuals can own reindeer, but in Russia they are owned by the state (ICR, 2011), so the population on the Kola Peninsula does not control herding. Reindeer herding and husbandry have important social, economic, and cultural functions in Sami society (Brannlund and Axelsson, 2011). While climate change will alter other aspects of this indigenous population’s livelihoods, the Sami will experience the greatest impacts in their reindeer husbandry activities, as herding is the most important form of land use among the Sami (Turner, et al, 2003). Sami reindeer herders are semi-nomadic, migrating with their herds to take advantage of the best foraging conditions. Herds of reindeer in the Arctic are large, usually numbering in the thousands, and migratory routes are hundreds of miles long (ICR, 2011). Reindeer husbandry depends on large grazing areas as low-productive vegetation is used for forage (Moen, 2008). Generally, herds spend summers in the alpine mountains, where they feed on shrubs and young trees, and spend winters near the sea in boreal forests, where lichen-rich pine is abundant (Moen, 2008). The highest forage quality for reindeer is found in the early summer as high altitudes provide ideal spring-like conditions, but in the winter, reindeer must survive on lichens, which they depend upon for energy sources (Moen, 2008). Unpredictable environmental stress in the Arctic is not uncommon, and through their knowledge of the land and reindeer husbandry that has been passed down for millennia, the Sami are incredibly adaptive (Tyler, et al, 2007) due to their knowledge of flexible herding strategies, supplemental feeding, and investment in alternative occupations (Brannlund and Axelsson, 2011). However, climate change compounded with additional external stresses is likely to affect reindeer husbandry activities on unprecedented levels as changes in the composition and productivity of grazing areas will greatly impact the size of the herds and migratory patterns, and adaptation may prove to be more difficult than it has historically been. Temperatures in the Arctic have increased at a rate of 0.09°C/decade over the past century (McBean, 2005) and are expected to increase 0.5-2°C over the next 20 years (IPCC (3), 2007). The rate of temperature change in the Arctic will continue to be greater than the rest of the world through the 21st century (IPCC (3), 2007). The impact of these temperature changes will vary seasonally as winter and spring will experience the greatest change in temperature and precipitation, and summer and autumn will experience the least (IPCC (1), 2007). The instances of extreme heat events will increase, and the instances of extreme cold events will decrease (Moen, 2008). In addition to rising temperatures as a result of global climatic changes, the North Atlantic Oscillation (NAO) will also impact seasonal variability in northern Scandinavia, yielding warmer and wetter summers (Moen, 2008). Weather, in addition to land access and land use, greatly affects forage ability and grazing conditions (Moen, 2008). The availability of lichen in the winter is determined by snow conditions and ice-crust formations (Moen, 2008), so predicted increases in winter temperature and precipitation will impact the lichen forage ability of the reindeer. In addition to impacts on foraging, climate change may also reduce the lichen population through increased competition with other species (Moen, 2008). Furthermore, changes in migratory patterns will be impeded as a result of warming temperatures as a decrease in thick ice over rivers and lakes will impede the movement of the herds inland (Tyler, et al, 2007). Changes in the timing of spring and autumn will also affect plant growth and nutrient availability, and alter nutrient availability (Moen, 2008). Summer warming trends will increase insect harassment, affecting the forage energy of the reindeer and ultimately increasing stress and decreasing grazing time (Moen, 2008). The Sami will therefore have to adapt their reindeer husbandry activities to account for these changes in foraging availability and capability, and flexibility in adaptation methods will be required as many effects of climate change on the grazing lands are unknown or unpredictable. Climate change in the region over the last 100 years exhibited at least as great a change as is projected over the next few decades, so the Sami should reasonably be able to adapt as they have in the past (Tyler, et al, 2007). As a greater diversity of landscapes are needed to sustain reindeer pastoralism over a long period of time (Tyler, et al, 2007), increasing the choice of foraging sites will be required to allow for greater migratory flexibility. However, this will be incredibly difficult as grazing lands are already in short supply as a result of infrastructure development and tourism (Moen, 2008). Therefore, it is argued that other non-climate factors may be more threatening to reindeer herding than the potential effects of climate change (Tyler, et al, 2007). Subsequently, the Sami may not be prepared to deal with the effects of climate change without significant support from the government and local non-indigenous populations to set aside and maintain sustainable grazing sites (Moen, 2008). Historically, the Sami have been at the will of multiple regimes, and “have had to contend with land encroachments, state-sponsored settlement programmes, discrimination, political and cultural oppression and policies of assimilation” that have resulted in loss of linguistic dialects and traditional ways of life for many communities (Henriksen, 2008). The issue of self-determination is now at the core of Sami-state relations. Citing international law, many Sami leaders argue that the right to self-determination can only be achieved through independent statehood and not merely by creating an autonomous region (Henriksen, 2008). However, in practical terms, Sami autonomy over internal affairs and the right to control Sami lands and natural resources is seen as an integral part of self-determination (Henriksen, 2008). The Sami Council, originally the Nordic Sami Council, was created as a political organization to defend the rights of Sami self-determination across Norway, Sweden, Finland, and Russia (Henriksen, 2008). Additionally, each country’s national governments have enacted different laws guaranteeing the rights of the Sami, and publicly elected Sami parliaments now exist in Norway, Sweden, and Finland, and in 1998 the Sami Parliamentary Council was created (Henriksen, 2008). While the majority of the Sami have recently enjoyed greater political and societal standing within their respective countries, rights to self-determination across state boundaries has not yet been decided upon. The proposed Nordic Sami Convention aims to standardize the existing laws across Norway, Sweden, and Finland to afford self-determination in Sami economic, social, and cultural affairs, including the use of natural resources, but does not allow for succession from existing states in accordance with international law (Henriksen, 2008). Land use and land rights have been at the core of discussions over self-determination. Under the International Labor Organization’s convention on indigenous populations, governments must recognize native ownership of the land that they traditionally occupied and had access to in the past, and nomadic people are specifically mentioned (ILO, 1989). While it is difficult to determine Sami territory due to their nomadic nature, it is believed that obtaining these rights is essential to their survival (Edmonds, 2007). As a signatory to the ILO Convention, Norway has taken the greatest steps to ensure Sami their historical rights to the land. Norway’s Finnmark Act, passed in 2005, resulted in a land transfer of approximately 95% of Finnmark from state ownership to the Finnmark Estate, which is jointly owned by the Sami Parliament and the County Council of Finnmark (Henriksen, 2008). Sweden, however, has not yet ratified the convention as the rights to resources on the land are also mentioned, and Sweden’s largest iron ore mine is located in Sami territory, thus delaying any substantive agreement on land rights (Edmonds, 2007). Despite the Norwegian laws recognizing indigenous land rights, use of many of those lands is still in the hands of private owners and the government. In theory, the Sami in Norway have the right to graze reindeer on any piece of uncultivated land, regardless of ownership, but this does not grant them exclusive access to the land and does not prevent land degradation by the land owners (Tyler, et al, 2007). Even with recognition to Sami land rights, infrastructure, increased domestication of other animals, and loss of access to land locally or as a result of international border closures will cause substantial loss of pastureland (Tyler, et al., 2007). Therefore, land disputes between Sami and non-indigenous civilians are common. One of the most recent and notable cases was a lawsuit brought against Sami herding populations in Harjedalen by a group of 780 Swedish landowners, in which they claimed that the Sami had no rights to the land being used for grazing (Saami Council, 2011). In 2004, Sweden decided that the Sami had not sufficiently proved their traditional presence on the land, which is very difficult to do in a society based upon oral tradition (Saami Council, 2011). This decision and subsequent years of pressure by Sweden on the Sami to give up their traditional grazing land sparked criticism from the United Nations (Saami Council, 2011). Despite the nonviolent and peaceful nature of the Nordic states, the potential for isolated incidences of conflict in the Arctic between the Sami and non-indigenous populations is possible when concerning land rights. The most prominent contemporary example of this is the case of the building of the hydroelectric dam in Alta, Norway in the 1980s. The government of Norway did not include the Sami in the decision-making process for the dam, disregarding local knowledge of the environment and the proposed dam’s negative impacts (Briggs, 2006). Protests, hunger strikes, and blockades ensued by the residents of Alta and neighboring Kautokeino, delaying construction on the dam for three years (Briggs, 2006). Sami activists even attempted to blow up a bridge near the dam’s construction site as a protest against its impact on reindeer migratory routes (BBC, 1997). As grazing land becomes scarcer in the event of great climatic shifts and tensions rise, more isolated incidences may occur between the Sami and surrounding populations. The Sami live in the Arctic regions of Norway, Sweden, Finland, and Russia’s Kola Peninsula. Although it does not include Russia, the region that is often referred to when discussing Sami inhabitation is Fennoscandia, which extends across northern Norway, Sweden, and Finland. 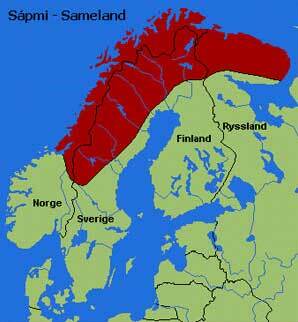 The Sami region can also be referred to as Sapmi. The use of Lappland to describe the region is considered offensive by many Sami. In comparison to the rest of the world, Fennoscandia is located on the same latitude as the top of Alaska and Canada, and is north of Iceland. The Sami are the only indigenous population in Scandinavia and are believed to descend from the Komsa people dating back 10,000 years. They speak three different but related languages of the Uralic family, and have many dialects within those languages. 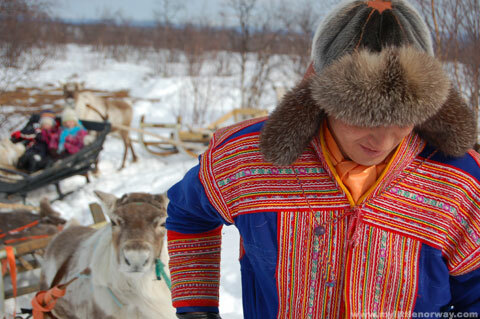 They are best known as reindeer herders but they also make their livelihoods in fishing, hunting, farming, and traditional handicrafts, and therefore have a strong connection with the natural environment. Reindeer have been an important part of Sami culture for 2-3,000 years (ICR, 2011), and they are the only people in the Nordic countries that are allowed to engage in reindeer husbandry activities. The Sami reindeer herders are semi-nomadic, migrating with their herds to take advantage of the best foraging conditions. Over a long period of time, the Sami have historically proven able to adapt their reindeer husbandry activities during times of environmental and societal stress while maintaining their culture and livelihood (Brannlund and Axelsson, 2011), but increased stress with decreased flexibility may prove too challenging in the future. The Nordic Sami Council was created in 1956 as a political organization to defend the rights of Sami self-determination, and at first represented all Sami populations living in the Nordic countries but changed the name to merely the Sami Council in 1991 to include those of the former Soviet Union (Henriksen, 2008).The Sami Parliamentary Council was created in 1998, and consists of publicly elected Sami parliaments from Norway, Sweden, and Finland. Russia has observer status only as they do not have their own Sami parliament (Henriksen, 2008). 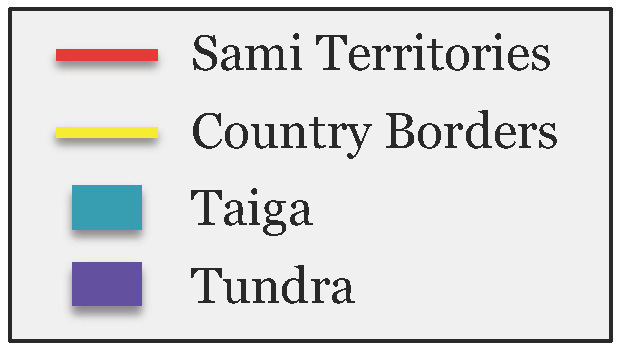 These groups represent the Sami in their desire for self-determination, arguing that autonomy of internal economic and social affairs, including the rights of Sami land and natural resources, should lie with the Sami (Henriksen, 2008). Norway has established guarantees to the Sami population by including a specific section in their Constitution on protecting Sami language, culture, and society, and it was from this that the Sami Parliament of Norway was created (Henriksen, 2008). However, mention of defined Sami homelands were omitted from the Constitution as there are numerous Sami enclaves across Norway and fear arose that defining homelands would be too exclusionary, but administrative areas for the Sami language have been established so Sami and Norwegian are equally official languages (Henriksen, 2008). In 2005, Norway further sought to protect the rights of the Sami through the Finnmark Act, which recognized that the Sami have historical rights to the land and natural resources, and resulted in a land transfer of approximately 95% of Finnmark from state ownership to the Finnmark Estate, which is jointly owned by the Sami Parliament and the County Council of Finnmark (Henriksen, 2008). Finland also afforded the Sami the same rights in their Constitution in 1999, but the Sami Act of 1995 defines a specific homeland (Henriksen, 2008). This act also requires that matters pertaining to land conservation and land transfers, education, and social and health services, among others, be negotiated with the Sami Parliament of Finland, but in practice they have merely been consulted, thus affording them little power as a decision-making body (Henriksen, 2008). 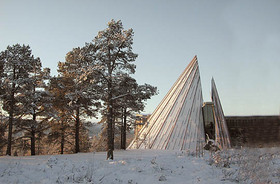 While Sweden has historically been the most conservative of the Nordic countries in recognizing indigenous rights and Sami rights have not yet been written into the Swedish constitution, the Sami Parliament has been formally defined as a state authority by the Sami Act of 1992, and in the past decade there has been a gradual shift in the Swedish position (Henriksen, 2008). In 2006, Sweden formally acknowledged the rights of indigenous people to self-determination in a report to the UN Committee on Economic, Social and Cultural Rights, which has been deemed a major shift in favor of Sami self-determination (Henriksen, 2008). Of the four countries, Russia is by far the least supportive of Sami self-determination. The Sami in the former Soviet Union suffered worse than the Nordic countries as a result of the state programs of centralized production, and were forcibly removed from their communities and made to live elsewhere, their villages being destroyed in the process so they could not return (Henriksen, 2008). They are incredibly sensitive to indigenous rights on the whole (possibly as a result of the conflict in Chechnya) despite a Constitutional provision recognizing the rights of indigenous populations, and have not afforded any formal rights to the population on the Kola Peninsula (Henriksen, 2008). The government of Russia also owns the rights to reindeer (ICR, 2011), so the Sami of Russia do not own the rights to their reindeer. Projections for the surface temperatures in the Arctic show an increase of 0.5-2°C from 2011-2030, 2-4°C increase from 2046-2065, and a 3-6°C increase from 2080-2099 (IPCC (3), 2007). The past rate of change in the Arctic has been much faster than the rest of the northern hemisphere as the average surface temperatures above 60°N have increased by 0.09°C/decade over the past century, which is greater than the 0.06°C/decade increase in the Northern Hemisphere (McBean, 2005). The rate of temperature change in the Arctic will continue to be greater than the rest of the world through the 21st century (IPCC (3), 2007). The rate of warming in the Arctic is strongest in the winter and spring, and smallest in the autumn (IPCC (1), 2007), and the instances of extreme heat events will rise while extreme cold events will decline (Moen, 2008). The North Atlantic Oscillation (NAO) will also affect seasonal variation in temperature and precipitation (Moen, 2008). Winters will be particularly susceptible in northern Scandinavia as an increase in the NAO is directly correlated with warmer and wetter winters, and is expected over the next 20-30 years (Moen, 2008). Additionally, the instances of variation in the NAO is expected to decrease over the next few decades, so the NAO will stay in the positive state and continue to produce warmer winters than it has in the past (Moen, 2008). Increased temperatures and changes in precipitation will affect forage ability and grazing conditions for the reindeer. The availability of lichen in the winter is determined by snow conditions and late-season ice-crust formations (Moen, 2008), so predicted increases in winter temperature and precipitation will have an enormous impact on the lichen forage ability of the reindeer. While a decrease of ground hardening as a result of shorter winters and warmer temperatures may result in significantly better forage capabilities, it is also likely that warmer and wetter winters may lead to an increase in ice-crust formations over the next couple of decades, which will make it more difficult for the reindeer to access the lichen (Moen, 2008). It is predicted that an increase in temperatures will also lead to higher productivity in the boreal forests, which will in turn produce more canopy cover, thereby increasing mosses on the ground and decreasing lichen as a result of competition (Moen, 2008). Image and caption courtesy of Tyler, et al, 2007. 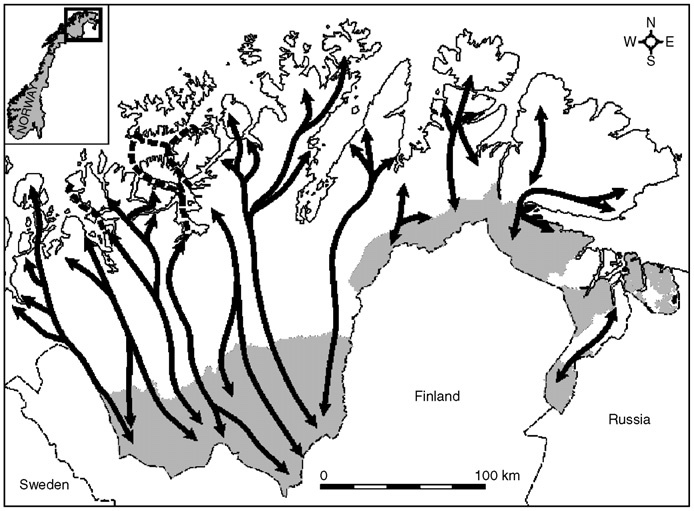 "The general pattern of migration of semi-domesticated reindeer in Finnmark. Herders here typically make two migrations with their animals each year, moving between geographically separate summer and winter pastures. In spring (April and May), they and their animals generally move to the mountainous coastal region where the reindeer are left on peninsulas or are swum or ferried across to islands where they feed throughout the summer, eating highly nutritious parts of dwarf shrubs, birch, willows, sedges and grasses. In September they are typically gathered and taken inland to winter pastures (shaded grey) characterized by open, upland plains of tundra and taiga birch scrub. For clarity, only a selection of migration routes (black arrows) and ferry routes (heavy dotted lines) are shown." In the summer, reindeer foraging capabilities in the alpine regions may be enhanced as a result of a higher quantity and quality of biomass resulting from warmer soils and more available nutrients in the soils (Moen, 2008). Increased biodiversity as a result of invasions by species from southern regions will also be beneficial as reindeer can feed off many plant species (Moen, 2008). However, changes in the timing of spring and autumn will alter plant growth and nutrient availability, and may actually decrease the lifespan and nutrient concentrations of forage plants, which will eventually alter the timing of migration patterns (Moen, 2008). It is also believed that warming trends will cause increased insect harassment of the reindeer in July and August, which greatly reduces their energy levels and foraging capabilities (Moen, 2008). Ultimately, it is predicted that summer grazing will experience increased stress and loss of grazing time, which will have negative effects on the reindeer populations (Moen, 2008). In addition to the impacts on habitat and the reindeer populations as a result of climate change, infrastructure development, such as hydroelectric power plants, oil pipelines, roads, railways, etc., also threatens the use of the rangeland. While habitat loss is minimal, studies have shown that reindeer avoid, by miles, pasturelands that have been disturbed, which has resulted in substantial habitat loss over the past few decades (Tyler, et al, 2007). Reindeer pastureland has decreased by 25% in the Barents Sea region, and a 35% loss in reindeer pastureland in the coastal area of Finnmark (Tyler, et al, 2007). It is predicted that by 2050, “78% of calving and summer ranges may fall into disuse from avoidance” (Tyler, et al, 2007). In addition to infrastructure, pastureland may decline due to increased grazing by other domesticated animals, loss of access to land locally, and loss of access to land as a result of the closure of international borders (Tyler, et al, 2007). The Sami region is located in the Arctic and comprises the tundra biome along the northern coastal region of Norway, and taiga biome in the south. The Sami travel across country borders with reindeer between the two biomes, generally spending the winter in the inland taiga where lichen is plentiful, and the summer in the tundra along the coast or in the mountains. Threats to grazing areas as a result of climate change and land development are occurring in the region both the Sami and non-indigenous landowners inhabit. While harm may be done in a courtroom or in the countries’ capitals while decisions on the Sami land rights are being made, the potential conflict will ultimately occur in the region in which the Sami live. Thus, the act and harm site are the same. The conflict is civil by nature as the Sami are primarily opposing civilians and governments for their grazing grounds within their own countries. Their self-determination over land access and resources is determined by the individual governments of the countries in which they primarily reside, but as the Sami and their respective decision-making bodies span multiple countries and indigenous issues are significant on the world stage, the conflict does have a significant external aspect. Access to the land and its resources for the use of reindeer herding is the primary source of conflict. The traditional rights of the Sami to their land that are guaranteed to them under international law are being threatened by non-indigenous landowners and government policies, which may significantly impact the livelihood of the Sami people. Tension over land use and ownership the Sami and non-indigenous landowners has the potential to cause isolated incidences of conflict. The projected fatality level in the dispute is incredibly low, almost nonexistent, and will result in fewer than 100 deaths over the course of the conflict. As the conflict will be small-scale and primarily be isolated between the Sami and the non-indigenous landowners, the military is not likely to get involved thus will not sustain any casualties. Anthropogenic climate change has caused documented temperature increases in the Arctic over the past few decades, and will continue to do so at a faster rate in the future. This will lead to a decline in forage ability and availability for the Sami reindeer herders, which will subsequently require greater grazing flexibility to adapt to the changes. However, infrastructure development by non-indigenous landowners will change the land use significantly, and will cause decreased access to traditional grazing lands and therefore decreased grazing flexibility. Both decreased access and grazing flexibility will lead to a decline in reindeer populations, which would have a very harmful effect on the Sami people. Rights to the land and its resources will cause conflict directly or through legal disputes between the Sami and non-indigenous landowners or the government. Legal disputes have the potential to hurt or help the Sami and their access to grazing lands depending upon the outcome of the dispute. Regardless of the outcome, legal disputes can lead to conflict. Conflict could subsequently have a negative effect on access to the grazing lands depending upon the level and severity of the conflict. Conflict would also negatively impact the Sami population. The actors primarily involved in the conflict are the Sami and non-indigenous landowners as they are the actors that have a direct interest in the land, so the level of strategic interest would remain at the sub state level. However, the individual states, the Nordic countries as a region, and multilateral institutions such as the Saami Council, Saami Parliamentary Council, the United Nations, and the International Labor Organization all have had input in past incidences, and have a vested interest in the rights of the Sami and indigenous land ownership and the outcome of the Sami land disputes. The situation does not currently have an outcome, and is therefore in progress. The conflicts may be ongoing even if decisive action taken on the state levels to determine land use rights in the Arctic. Tension over land rights and self-determination may not be able to be mitigated by decisions made in capitals thousands of miles away. Baird, R. (April 2008). The Impact of Climate Change on Minorities and Indigenous Peoples. Minority Rights Group International. <http://www2.ohchr.org/english/issues/climatechange/docs/submissions/Minority_Rights_Group_International.pdf> Accessed June 26, 2011. Barents Observer. (2008). Fighting for Sami Parliament in Russia. <http://www.barentsobserver.com/fighting-for-sami-parliament-in-russia.4530696-16149.html> Accessed July 8, 2011. BBC News. (1997, December 15). Norway Returns Skulls of Lappish Dead. <http://news.bbc.co.uk/2/hi/39626.stm> Accessed July 6, 2011. Brannlund, I., Axelsson, P. (2011). Reindeer management during the colonization of Sami lands: A long-termperspective of vulnerability and adaptation strategies. Global Enviromental Change, 21 (3), 1095-1105. Briggs, C.M. (2006). Science, local knowledge and exclusionary practices: Lessons from the Alta Dam case. Norsk Geografisk Tidsskrift - Norwegian Journal of Geography, 60, 149-160. Central Intelligence Agency. (2011). Europe. CIA World Factbook. <https://www.cia.gov/library/publications/the-world-factbook/wfbExt/region_eur.html> Accessed July 2, 2011. Edmonds, S. (2007, January 8). Sweden’s Sami struggle over land rights. Reuters Online. <http://www.reuters.com/article/2007/01/08/us-arctic-sami-idUSL0320809920070108> Accessed July 7, 2011. Henriksen, J.B. (2008, March). The Continuous Process of Recognition and Implementation of the Sami People’s Right to Self-Determination. Cambridge Review of International Affairs, 21(1), 27-40. <http://dx.doi.org/10.1080/09557570701828402> Accessed May 21, 2011. Intergovernmental Panel on Climate Change (1). (2007). 15.2 Current Sensitivity/Vulnerability. IPCC Fourth Assessment Report, Climate Change 2007: Working Group II: Impacts, Adaption and Vulnerability. <http://www.ipcc.ch/publications_and_data/ar4/wg2/en/ch15s15-2.html#15-2-1> Accessed July 2, 2011. Intergovernmental Panel on Climate Change (2). (2007). 15.3.4 Projected Changes on Land. IPCC Fourth Assessment Report, Climate Change 2007: Working Group II: Impacts, Adaption and Vulnerability. <http://www.ipcc.ch/publications_and_data/ar4/wg2/en/ch15s15-2.html#15-2-1> Accessed July 2, 2011. Intergovernmental Panel on Climate Change (3). (2007). Figure 10.8 - AR4 WGI Chapter 10: Global Climate Predictions. In IPCC Fourth Assessment Report, Climate Change 2007: Working Group I: The Physical Science Basis. <http://www.ipcc.ch/publications_and_data/ar4/wg1/en/figure-10-8.html > Accessed July 3, 2011.
International Centre for Reindeer Husbandry. (2011). About Reindeer Husbandry. The International Association of Reindeer Herders. <http://icr.arcticportal.org/index.php?option=com_content&view=article&id=687&Itemid=124&lang=en> Accessed July 8, 2011.
International Labor Organization. (1989). C169 Indigenous and Tribal Peoples Convention. <http://www.ilo.org/ilolex/cgi-lex/convde.pl?C169> Accessed July 6, 2011. McBean, G. (2005). Arctic Climate: Past and Present. In C. Symon (Ed. ), Arctic Climate Impact Assessment (pp.22-60). Cambridge: Cambridge University Press. Moen, J. (2008). 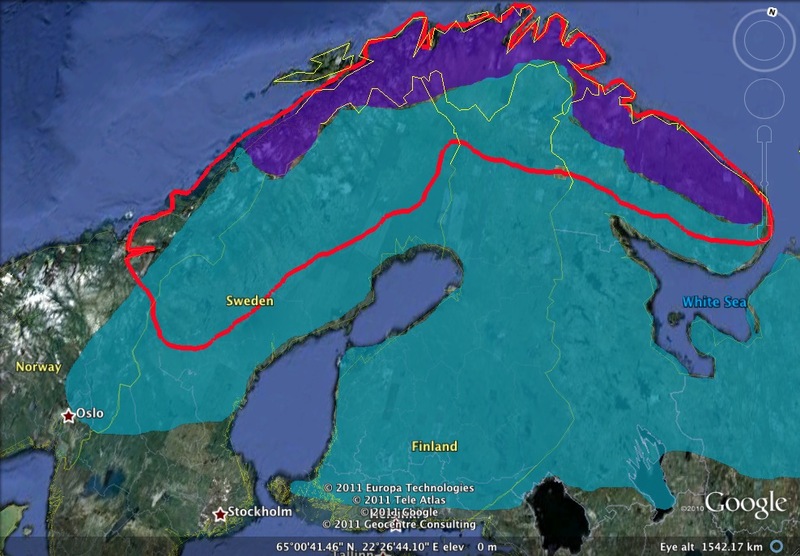 Climate Change: Effects on the Ecological Basis for Reindeer Husbandry in Sweden. Ambio: A Journal of the Human Environment, 37(4), 304-311. <http://www.bioone.org/doi/full/10.1579/00447447%282008%2937%5B304%3ACCEOTE%5D2.0.CO%3B2> Accessed May 22, 2011. My Little Norway. (2008-2009). <http://mylittlenorway.com/> Accessed July 8, 2011. Saami Council. (2011, April 9). Sweden forces Saami reindeer herding communities to give up rights'. International Center for Reindeer Husbandry. <http://icr.arcticportal.org/index.php?option=com_content&view=article&id=1882%3Asweden-forces-saami-reindeer-herding-communities-to-give-up-rights-saami-council-press-release&catid=108%3Anews-latest&Itemid=4&lang=en> Accessed July 8, 2011. Sacred Land Film Project. (2011). Lands of the Sami. <http://www.sacredland.org/lands-of-the-sami/> Accessed July 8, 2011. Turner, B.L., et al. (July 2003). Illustrating the coupled human-environment system for vulnerability analysis: Three case studies. Proceedings of the National Academies of Sciences, 1001(4), 8080-8085. Tyler, N. et al. (2007). Saami reindeer pastoralism under climate change: Applying a generalized framework for vulnerability studies to a sub-arctic social-ecological system. Global Environmental Change, 17, 191-206. <www.uio.no/studier/emner/annet/sum/SUM4015/h08/Tyler.pdf> Accessed July 7, 2011.